The capital city of South Africa is the most beautiful in the north of SA, the Administrative and education hub, with a wealth of history and innovation. See the Voortrekker Monument, the Union Buildings, Kruger house, Church Square, and many other landmarks of beauty and interest in this green government city of South Africa. Known as the Jacaranda city, it brings to life the development of this northern region of South Africa. What would you like to see? Tell us, and we take you there on a journey through the most beautiful and interesting streets, exploring together, while you enjoy the sights and sounds..
Pretoria is the capital city of South Africa, aka the Jacaranda City, established in 1855, which in 1860 became the new capital of the Zuid-Afrikaansche Republiek, after Potchefstroom. Its was first known as Pretoriusdorp. The ZAR was independant from Britain, established by the Voortrekkers (Pioneers) in the norhern part of what is the current South African Republic. Until gold was discovered in 1886 on the Witwatesrand main gold reef, where Johannesburg was created, this part of the world was sparsely inhabited, initially by the San (Bushman) people, then the first Southern Transvaal Ndebele (1600), Northern Sothos and the later Zulu under Mzilikazi, who fled in 1832 westwards and northwards, to get away from the main Zulu mfecane, started by Shaka. Geology: The area is on the transition between highveld and bushveld, nestled between the different east-west mountain ridges of the Magalies Mountains, at a height of around 1350m above sea level. At Tswaing crater, 40km north of the city, a 60m diameter meteoroid hit earth some 200 000 years ago, at a speed of around 16km per second, and left an eventual 1km wide crater. It had some influence on the upheaval of the original horisontal layers around it. The serious upheavel of the Magalies mountain ranges around Pretoria came much earlier though, when a 10km diameter asteroid hit earth about 2023 million years ago at the Vredefort Dome, now a World Heritage site, 160km to the south, and south of Johannesburg. Today, only the eroded remains of a much larger dome of about 300km in diameter can be seen. The original dome was created by the rebound of the rock below the impact site after the asteroid hit earth, which eroded to the current 70km diameter remains. About 70 cubic km of rock is estimated to have been vaporised in the impact. The upliftment of the horisontal layers exposed the riches of Platinum, Palladium, Chromium, Nickel and Copper just north-west of Pretoria, where mines stand in ever-increasing numbers, stretching even past Rustenburg to the west. The climate in Pretoria is one of the best in the world, with temperate to cold, short dry winters, and hot to mild summers with occasional rain. Snow falls are extremely rare in Pretoria. In 1959, 1968 and 2012 snowflakes were spotted in the city, but never to build up an accumulation. A countrywide heatwave in November 2011, saw Pretoria experiencing temperatures that reached 39 degrees C (102 degrees F), an extraordinary occurrance for the beginning of real summer in the city. The original town was laid out around Church Square, near the Apies River, which is fed from the strong fountains south of the city. Green parks and many trees along the streets, make Pretoria a haven for the many students, government workers and businesses in the city and suburbs. During October and November, the Jacaranda trees are covered in lilac-mauve, purple flowers, and compete for attention among the many other colours from the different trees, shrubs, and other plants, like bougainvillea, African flame-, Coral-, Kapok-, Silver Oak-, and Acacia trees, and Agapanthus and Roses, to name but a few. Marthinus Wessel Pretorius, a leader of the Voortrekkers, named Pretoria after his father, Andries Pretorius. Andries had become a hero among the Voortrekkers after his victory over the Zulus at the Battle of Blood River. He also negotiated the Sand River Convention of 1852, in which Britain acknowledged the independence of the Zuid-Afrikaansche Republiek (Transvaal). On the 1st of May, 1860, Pretoria became the capital of the ZAR. With it came stablity among the movement and settlement of the Great Trek. 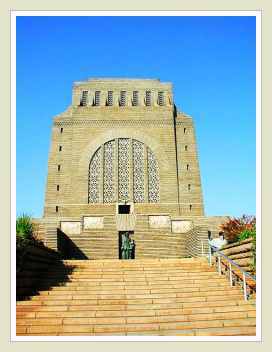 The monumental Voortrekker Monument is a site not to be missed, and the central Church Square, and Union Buildings should be visited. 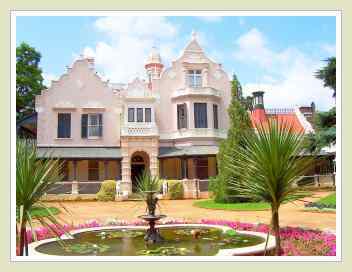 The imposing yet humble Kruger House, Melrose Victorian House museum, and the Transvaal Museum opposite the City Hall, take a while longer. UNISA and the Telkom telecommunications tower, Pretoria University, and the white Jacarandas are a few more of the sights in Pretoria. 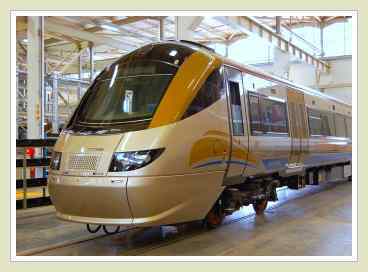 More time can be spent at the National Zoological Gardens and the Pretoria National Botanical Gardens, and you might want to consider a ride in the Gautrain, SA's first speed train, linking Pretoria from Hatfield and Pretoria Stations, with Centurion, the OR Tambo International Airport, Sandton and Johannesburg. The city has a long history with the different wars of South Africa since its creation by the Voortrekkers in 1855. During the First Freedom War after Britain annexed the Zuid-Afrikaansche Republiek (ZAR), Pretoria was besieged by Z.A.Republican forces in December 1880 and March 1881. After the decisive battle at Majuba near the Natal border, where the ZAR regained its independance, the peace treaty between the ZAR and Britain was signed in Pretoria at the Pretoria Convention on 3 August 1881. Forts around the city were built for its defence, just prior to the Anglo-Boer War of 1899 to 1902. A few of these forts have been preserved as national monuments. The Second Freedom War (Anglo-Boer War) resulted in the end of the ZAR (Transvaal) and was the beginning of British hegemony in South Africa. Winston Churchill, who was a war correspondent for the London Morning Post, was imprisoned in the Staats Model School in Pretoria, from where he escaped to Mozambique, to later arrive in Durban. Frederick Roberts, commander of the invading British troops, occupied Pretoria on 5 June 1900. Eventually the war was ended with the signing of the Peace Treaty of Vereeniging on 31 May 1902 in Melrose House, Pretoria. The Transvaal and the Free State, further south, became two more British colonies, together with the Cape and Natal colonies, until the Union of South Africa was established in 1910, consolidating the four colonies into one. 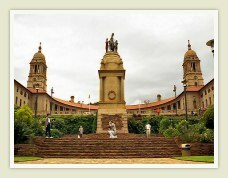 The Union Buildings on the north-eastern edge of the city centre, was built to house the government of the new Union. 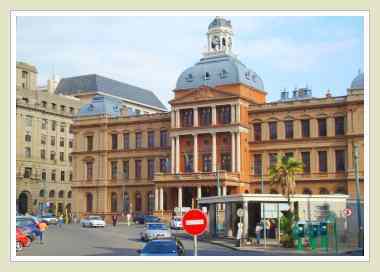 Pretoria then became the administrative capital of the whole of South Africa, with Cape Town the legislative capital, and Bloemfontein the Judicial capital. From 1860 to 1994, Pretoria was also the capital of the province of Transvaal. Pretoria's main street, Church Street (now renamed to 4 different names), is the longest urban street in South Africa, and one of the longest straight streets in the world. Pretoria gained city status on 14 October 1931. On 5 Dec. 2000 the City of Tshwane Metropolitan Municipality was established. Fourteen former separate local authorities were combined into the new Municipality, forming the second largest municipality in Gauteng Province, and is among the six biggest metropolitan municipalities in South Africa. Tshwane's towns and townships are: Pretoria, Centurion, Akasia, Soshanguve, Mabopane, Atteridgeville, Ga-Rankuwa, Winterveld, Hammanskraal, Temba, Pienaarsrivier, Crocodile River and Mamelodi. Community service, followed by Finance and Manufacturing, forms the main economic sectors in Tshwane's municipal area. Within Manufacturing, the largest sub-sectors are Metal products, Machinery and Household appliances, followed by Transport equipment. The major Banks and Financial services institutions have offices in the municipal area of Tshwane. Here, a rich cultural heritage is intertwined with the South African history, with a key role in the politics of South Africa. SA's new democracy was born at the Union Buildings, where on 10 May 1994, the popular people's president, Nelson Mandela, was inaugurated as South Africa's first democratically elected black president. -Natalie Alwyne Steward (1943-04-30--), female British Olympic swimmer. Represented Great Britain at 1960 Olympic Games in Rome, Italy, in four events: she won Bronze - 100 m freestyle in 1:03.1, Silver - 100 m backstroke in 1:10.8. Assisted women's teams to final in both 4x100 m freestyle and 4x100 m medley relays - the team finishing fifth in both events. -Elna Reinach (1968-02-22--) Female pro Tennis player. Won the US Open mixed doubles championship in 1994 with Patrick Galbraith. Played in 1992 Summer Olympics, where she lost in the first round to Jennifer Capriati. Reinach was runner-up at the French Open with Danie Visser in 1993. -Hendrick Mokganyetsi (1975-09-07--)South African sprinter, specializes in the 400 meters. Personal best time 44.59 seconds (Sep. 2000 in Yokohama). His strong personal best in the 800 meters, is 1:44.62 minutes (1997). With Jopie van Oudtshoorn, Adriaan Botha and Arnaud Malherbe he holds the SA record in 4 x 400 meters relay with 3:00.20 minutes. -Roland Mark Schoeman (1980-07-03--) South African swimmer, 2004 Olympic Games. Short-course 50 meters freestyle, time of 20.30 seconds. -Cameron van der Burgh (1988-05-25--) South African swimmer, Africa's first home-trained world record holder and the youngest at age 20. Represented SA at the 2008 Summer Olympics, won numerous World Championship medals since his debut in 2007 when he won Bronze. -Magnus Malan, 1930: National Party, South Africa, South Africa. -Murad Velshi, 1935: Ontario Liberal Party Canada. -Marike de Klerk, 1937: National Party, First Lady of South Africa before 1994. -Johan de Waal, 1949: Democratic Turnhalle Alliance of Namibia. -Anchen Dreyer, 1952: Democratic Alliance South Africa. Come learn more about Pretoria with Touring South Africa -- Let us take you on a journey through the Capital City of South Africa, and enjoy a relaxed, informative few hours with us.